Trading since 1988, we have unrivalled experience in the Automated Testing Industry, whatever the requirements. From design and build to fixtures and programs, we provide a complete automated testing service. We have multiple automated test equipment and systems installed in the Military, Aerospace, Power, Automotive and other industries throughout the UK. Our expertise adds value to these sectors and meets a diverse set of needs ranging from Board testing to Module testing. We have solutions for In-Circuit Testing, Functional Testing and JTAG Boundary Scan Test. ATE Solutions manage projects from the early stages of product development looking at DFT and Test Strategy through to installing a fully commissioned system and applications with lifetime support. 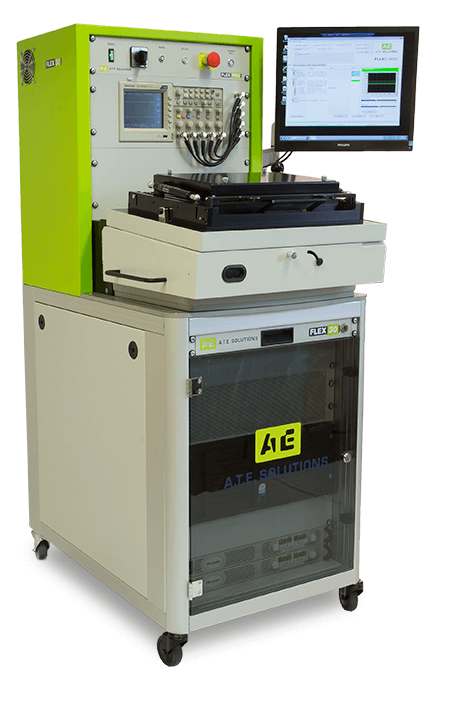 Whether your requirement is for a small entry level Test machine or a fully loaded complex system, we have a range of Flexible ATE test systems available. We are a trusted supplier with many automated testing installations throughout the UK. for analogue and digital applications. the staff and experience to solve your test problems. Hardware and software solutions for old test systems such as Teradyne, GenRad, Marconi and Wayne Kerr. With 13 application engineers located on two sites in the UK we have the resource available to support you now and in the future.